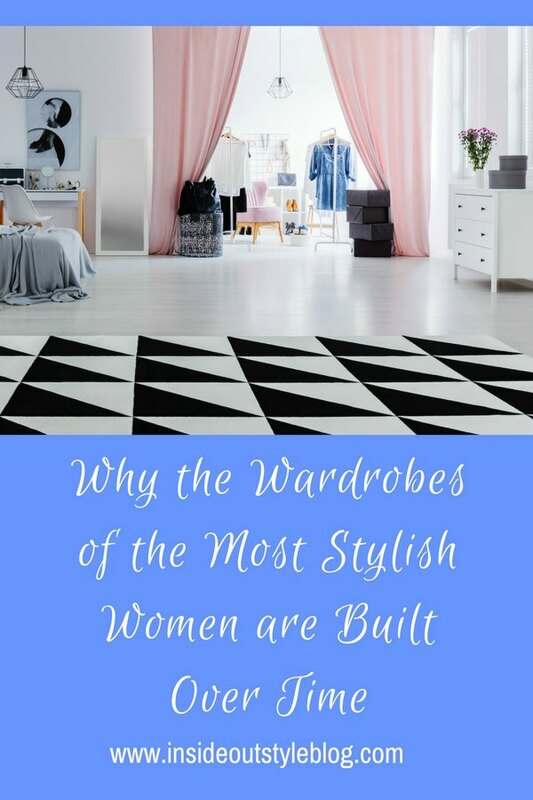 After over 14 years of spending time in the wardrobes of women from all around the world, of different ages and occupations, the common theme I’ve discovered is that the very best wardrobes of the women who are most stylish are built over time. 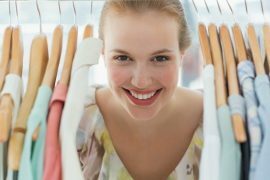 One shopping trip will not get you the wardrobe of your dreams – even if you are Oprah and you decide to throw the whole wardrobe out in one go and you’ve got the cash to replace it all! It’s unlikely that at any one time in retail history, that all the colours, styles and shapes of clothes with the details you like will be available for you to purchase. In fact, for many of us, there are whole seasons that may go past where the fashion trends available everywhere just aren’t our colours or styles. Plus you’ll never ever get your full range of colours in any one season. Just like clothing styles, colours go in and out of fashion too, as you’d know from the Pantone fashion trend reports that I write about here, and will have noticed yourselves that quite often there will be dominant colours in the stores at one time (and it can feel like nothing else). Depending on your body shape, some trends will flatter, others will not. This is actually great (in some way), just not for all of us, all of the time. But when there is a trend that suits an H shape it is unlikely to suit an X or A shape. But we all need to be able to buy clothes, and so it wouldn’t be great if everything that was sold only suited one body shape all of the time. Every wardrobe needs both basics and hero (aka statement) garments. Basics are the workhorses of your wardrobe, they provide a background for your hero items. Finding the right basics can be tricky – you want the colours and fit that flatter your figure in good quality fabrics that will last over time. I mean, what’s the point in contributing to landfill and having to constantly source these kinds of wardrobe basics? It’s not a good strategy for either your wardrobe or the planet. Taking the time to find great basics in good neutrals that flatter you is so worth its weight in sartorial gold. Settling for black when it’s not your colour because it’s easy to find may sometimes feel like the right decision, but ends up being something that isn’t a good investment. Heroes are the statement garments that make your outfits sing (in tune and with a brilliant sound). Just like basics, finding the heroes that speak to your style recipe, to your personality and to your body and style (colouring, scale, features and the whole kitten-kaboodle) can also be tricky. In my experience of building my own wardrobe, they are pieces that I stumble across here and there (never when looking specifically) that call to me to be brought home to my wardrobe and will add spice and interest to my outfits for years to come. So apart from the fact that you may not be able to find what you want to buy for your wardrobe today but given the speed of change of stock in retail these days, you may find what you’re after next week or next month), what do you need to know to build your ideal stylish wardrobe? Your body equation is important to know as it is your guide to some of the figure flattery elements that will have your purchasing garments that enhance your body. Then, of course, you need to know your colouring (this gives you a palette of colours that harmonise both together and with you, making it easy to create a mix and match, a versatile wardrobe of clothes that make you look healthy, vibrant and alive). Your contrast (both colour and value) and your scale are two more important elements of this physical mix. 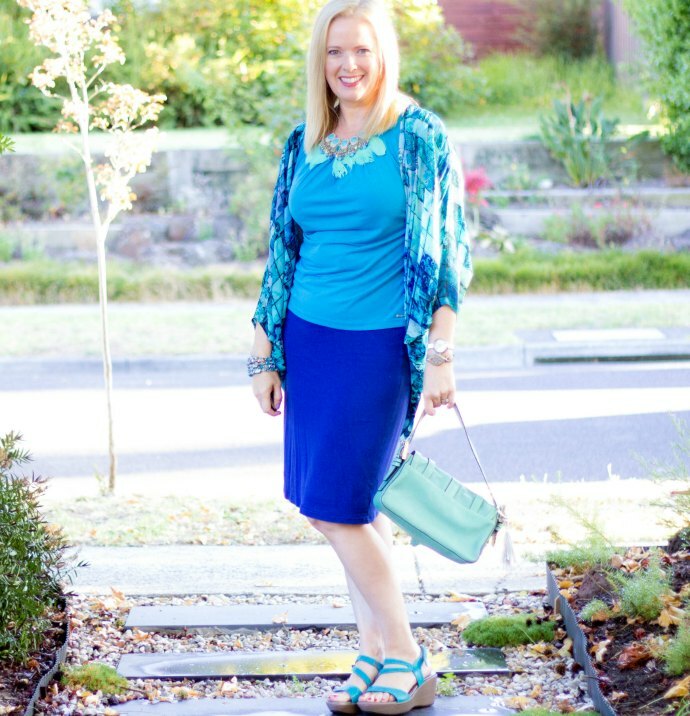 This outfit was built over many seasons – the skirt is 5-6 years old, the top and shoes from last year, the kimono the year before, the necklace 4 years ago and the bag 7 years ago. The physical is important but no more important than the personality element of style. Not knowing how you like to express yourself through your clothes, their patterns details along with their styles, means that you’ll end up purchasing a bunch of the ‘wrong’ pieces over time that never ever feel quite right. Having a style recipe that speaks to your current lifestyle and style preferences will also guide you in purchasing items that enhance your outfits and make you feel great and stop you making expensive (or even what seem to be inexpensive) purchasing decisions. Creating style is a skill that can be learned. Sure some of us have a natural talent for it, and it appears easy, but for others (like me) it was something I had to learn (and what I share here and in detail in my online programs). In fact I created a simple outfit formula that you can use to create fabulous outfits day after day. I’m not sure about you, but I certainly wasn’t taught about how to put together an outfit, how to choose an accessory, or what suited my unique body at school. These are all pieces of knowledge I’ve acquired over time (as well as through my image consulting training) and now share with you to make your learning process easier, faster and less costly. 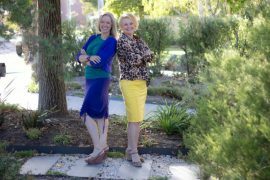 This is why I developed my 7 Steps to Style program – to give you a shortcut to mastering the “what suits me” equation. It has the information on dressing your physical, personality, colouring and lifestyle (as well as incorporating your values) into your style equation plus my experienced eye to give you an objective decision. I’ve seen thousands and thousands of dollars of unworn or barely worn garments thrown out of wardrobes because the owner of them didn’t understand these elements of style. The investment in knowledge is paid back many times over as not only do you feel more confident when you know your clothing looks great on you (and feels ‘right’), but you also stop wasting money on the wrong things. So even if you had Oprah’s bottomless purse to replace your entire wardrobe at once, unless you were having everything tailor-made to your specifications, it still would be impossible to create a fabulously stylish wardrobe that reflects you all at once. Hi Imogen! It makes total sense except I wonder how stable a person’s shape is over time. Pregnancies, menopause, aging, just life … I am always surprised when people talk about 25 year old pieces they’re still wearing because it sounds like they retained their shape from 20s to 50s, and how common is that? I think a question along these lines if what many readers will be wondering about. I think some people’s shape seems to change less, and for others of us, body shapes change more. I think sometimes those who haven’t had children tend to keep their shape more than those who do. I agree with this article, for sure my wardrobe is being very well built over this time. And every year that passes is more interesting. Is Barbie’s Body Even Possible?